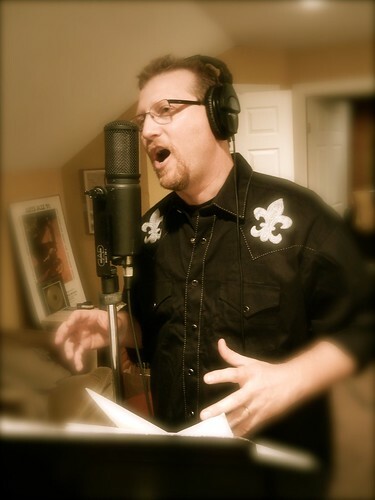 Philip Nelson lays down vocal tracks for his album "Adventures from the Road"
Having jammed with the likes of Jon Anderson of Yes, Pat Dininzio of The Smithereens and Grammy Nominee Peter Himmelman, Philip Nelson certainly has no shortage of top-notch experience under his belt. His inaugural album, “Adventures from the Road,” began with an impromptu songwriting session with the legendary Himmelman. Nelson eventually recorded a single, “Racing Off to Nowhere,” with the Grammy-nominated singer/songwriter, which catapulted him into the extraordinary efforts that have resulted in his first LP. A native of Monroe, Louisiana and now a resident of San Antonio, Texas, Nelson has taken his music across the globe. He has performed in New York City, Nashville, Las Vegas, New Orleans, Tokyo, and on the steps of the Sacré Coeur Basilica in Paris. Whether he’s captivating audiences at the MGM Grand in Las Vegas or playing for tips in New Orleans’ French Quarter, Nelson combines his storytelling ability and diverse musical style to create a quirky and highly entertaining repertoire wherever he goes. Our prayers and best wishes for a successful and happy singing career that will allow you to maintian your closeness to the Lord and your wonderful family. Right now we see a wonderful future for you and yours.